On my nails I have New York Noir by Nails Inc. I mentioned it on my Glamour freebie blog post, and I've used it a couple of times since. After two coats it has the right amount of shine but I always use Sally Hansen's top coat after my friend recommended it to me. 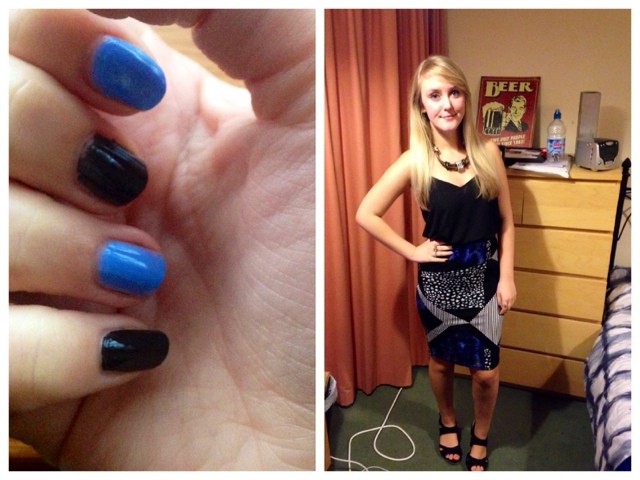 The blue colour is Barry M's gelly polish in Blueberry. The Gelly Nail Effects were all the rage in the summer months but now the Matte colours are very popular. I need to get my hands on the latter, however the gel polishes are still some of my faves. Pretty much my entire outfit is from Topshop. I included this photo in my Instagram Update last week - the skirt is from the petite section and the top is a cami (Topshop are big on these at the moment and do them in lots of different colours). I tucked it in because the skirt is quite long so I had to pull it above my hips. I'm also wearing a Topshop necklace and New Look wedges. You look lovely. Wish I could pull off those types of skirts, they're so classy. Love your nails too, I have that Barry m one, such a nice shade.